On the west side of the Strip, there are three trams that run between hotels. Most of them are MGM properties. Since they are free, obviously they are a cheap form of transportation. They are not always practical if you are moving down the east side of the Strip, but for those with no car and a hesitancy to pay for cabs, a combination of buses and trams can make getting up and down the Strip easier on your budget. This is the first of three trams that run along the west side of the Strip. All of them are free and serve the purpose of connecting casino properties on the west side of the Strip. These trams can be used as free transportation, but they are also something to do for free on the Strip. The first time you go on the tram, you may want to go during the day, because you will be able to see more. However, you should think about traveling at night as well. With all of the lights, it can be beautiful at night, but you may not know what you are looking at if you’re seeing it for the first time. I refer to the first tram as as tram one because I am describing this tram first, and then moving in order from south to north. However, these number designations are mine alone. There are actually two trams that operate between Mandalay Bay and Excalibur. Although both of these trams travel from Mandalay Bay to Excalibur and back again, one of the trams will stop at the Luxor, while the other tram is non-stop to Excalibur and back. The first time I took this tram, it moved a bit faster than I anticipated. It may have been because this tram operates out in the open, and it is easy to see the ground below. In fact, it is the only tram among the three that is easy to see from Las Vegas Blvd., at least during the daytime. If you do ride it during the day, the outside of the Luxor building and the statues below the tram tracks are eye catching, so if you have the time, you may enjoy walking outside the Luxor to see these replicas of ancient Egypt. This is a photo of the Mandalay Bay tram station. The Monte Carlo has been under renovation for several months and is now called Park MGM. At the time of this writing, it was almost complete. 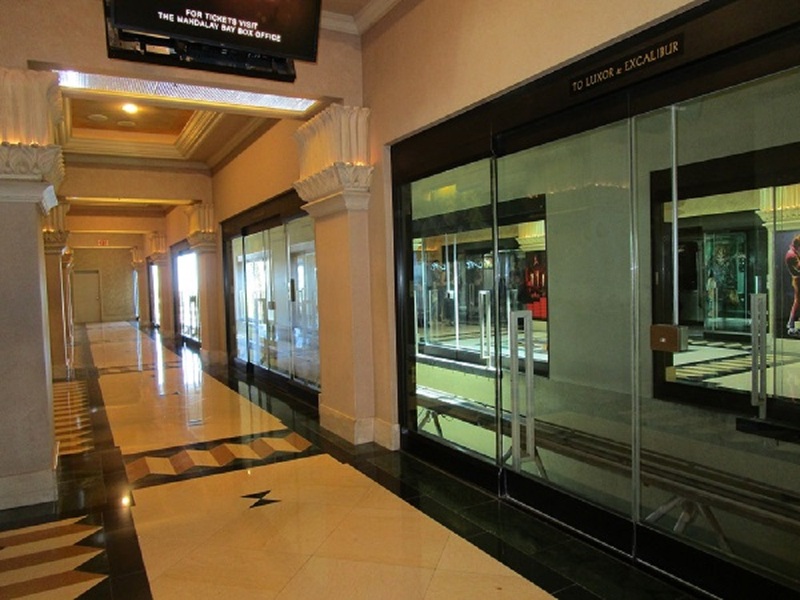 It looks like the only thing left is in the front of the casino, so you may have to enter from the side door. In either case, you will want to head to the back of the casino where the pool area is located. When you see the pool sign, you make a right and walk down the hallway. The hallway is long and will make several changes in direction as you move through it, but there are no choices along your path; you will not get lost, just follow the signs. The passageway ends at an escalator. Go up the escalator. After you make it to the top, move to your left and you will see a sign above a set of doors that says, “Tram to Crystal Shops and Bellagio.” Go through the doors. You are now outside the hotel. Look forward and to your right, you will see another escalator moving up. This leads to the tram platform. Once you reach the top, you will find two boarding areas for the tram. They are exactly the same. There are two trams. Both of them go to the same destination. They have two trams so they can move more people, and the wait isn’t as long, so you will be able to catch the next arriving tram. Both trams have two stops: Park MGM to Crystals Shops/Aria, then on to Bellagio. The trams then make a return trip, stopping at Aria before ending the trip at Park MGM. You can catch this tram at the Crystals Shops, just look for the signs directing you to the tram station inside the mall. Catching the tram at Bellagio is a bit tricky. You need to walk past both the registration desk and the conservatory, walking down a long series of corridors with restaurants and shops. There are signs along the way. This is the single biggest problem with the trams; there is a lot of walking involved when using them. But they are free, so I can’t complain too much. 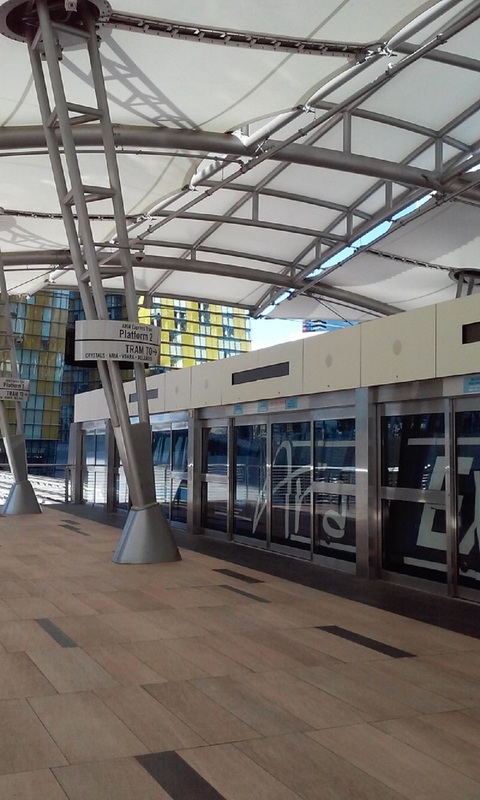 This is a photo of the Aria tram station. This is the third of three trams, and like the other two, it is free to use. It is the shortest distance traveled by any of the three trams, only covering the distance between the Mirage and Treasure Island. Although the trip only takes a few seconds, if you look towards the Strip, there is some scenery. To me, the Mirage at night, with its lighting, gives it one of the most beautiful appearances of any hotel on the Strip. 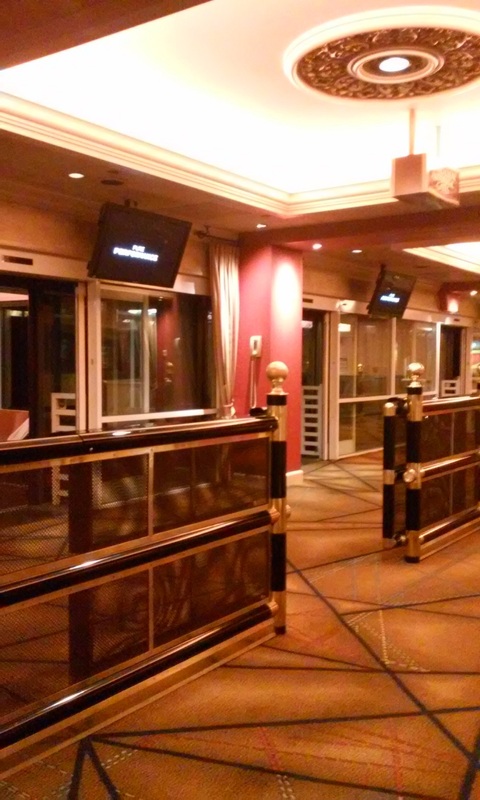 The tram station at the Mirage is located outdoors next to the entrance to the hotel on the right side. The Treasure Island tram station is located in the back, toward the right side of the casino. From the front entrance, walk on the right side, past the buffet. When you get to a large corridor of retail shops, make a right. It’s just a few yards of walking and you’ll see escalators that will take you to the tram station. The entrance will be to your left. 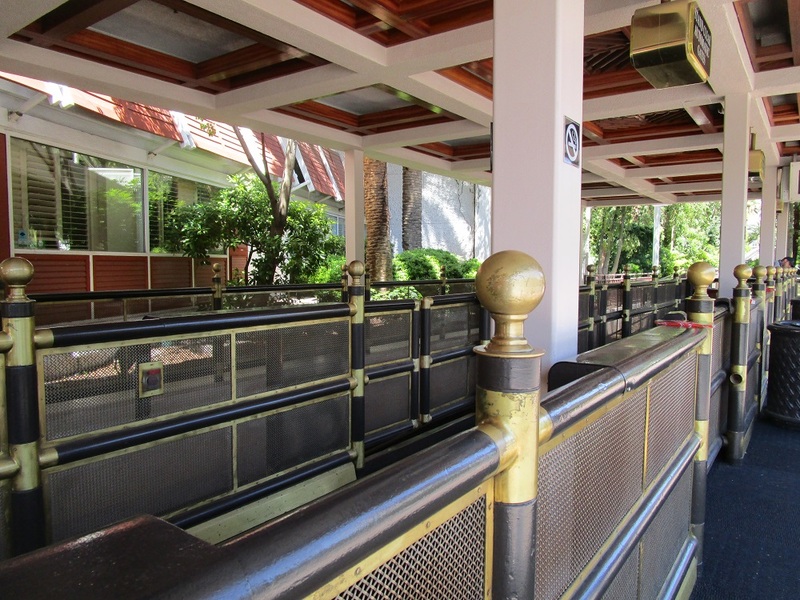 Here is a photo of the Mirage tram station. Here is a photo of the Treasure Island tram station. For self-guided tour of 18 things to do for free on The Strip, read our new book Free Things To Do on the Las Vegas Strip: A Self-Guided Tour by Matt Lashley.